Grand Theft Auto: Chinatown Wars is the newest handheld game in the GTA series. The game was announced on July 15th 2008 at E3 and was released in March 2009 on the Nintendo DS in North America and Europe. 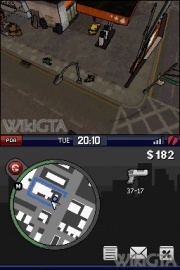 Because of this new platform, GTA Chinatown Wars has a new game-engine and also uses the touch screen and the Wi-Fi connection of the Nintendo DS. The game was later ported to the PSP, iPod and iPhone Touch. After the murder of his father, Huang Lee receives a very simple order: bring the antique sword Yu Jian to your uncle Kenny and let your family hold the power over the Triads in Liberty City. Until then, Huang is a spoiled rich son who expects everything to run smoothly. But on arrival at Francis International Airport, Liberty City, Huang is deprived of the sword and left for dead. To take revenge and for rehabilitation, he risks his life in the most dangerous city of the world to get the sword back. The upper screen shows the gameplay, while the touch screen shows the radar, PDA and other elements of the HUD. 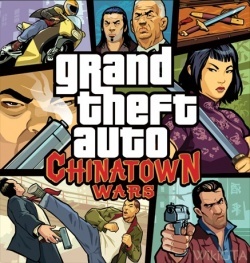 GTA: Chinatown Wars is set in the GTA IV rendition of Liberty City. The game uses cel shaded graphics and has an isometric camera view. Despite this, life in the city is advanced: people talk to each other, buy food and use umbrellas when it's raining. Like the TPV GTA's the game has an 24-hours system with day-night cycle. The wanted level system in Chinatown Wars has been overhauled. In stead of running away for the police you have to let the police cars crash to shake them of. Another difference between Chinatown Wars and the other GTA's is the freedom from the beginning of the game: you can travel through whole Liberty City, as no areas are blocked off.